Enhance the look and feel of your printed materials by using the Kompac Elite Label 10 - a small, yet powerful UV & aqueous coating and priming system capable of fitting label rolls or cut sheets up to 10” wide by any length. This compact desktop coater is the perfect inline/offline solution for smaller print jobs and provides production-level quality. In-house label coating just got easier with Kompac's Elite Label 10 UV and Aqueous coating solution! Prime substrates before inkjet and digital label printing - or coat them afterwards with a variety of finishes ranging from high gloss to matte! Eliminates the need for re-circulation of the coating – no waste! Labels and sheets flood coated on the Elite Label 10 provide abrasion resistance and added durability for products with repeat handling and shipping, protection from the outdoor elements, and shields against chemicals, cleaners, fingerprints, foods and water. Whether digital or offset printing, the Kompac Elite Label 10 will enhance the aesthetic quality and create the ultimate finish with vibrant, rich colors and brilliant shine. 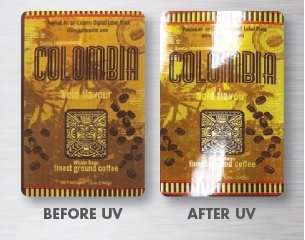 The difference between a basic printed coffee label, and one that was UV flood coated with the Elite 10! A proper coating can enhance the appearance and durability, increasing the printed product’s value. Kompac offers a wide range of finishing options, with a complete line of UV, aqueous, specialty coatings and primers available for all products. Kompac will help you create a visually outstanding finished product! Place orders through our website, or by contacting our sales department. Available in 1, 2.5 & 5 gallon pails, these coatings can be ordered and shipped worldwide.